This program is very helpful in cleaning your computer and speed up the boot up speed by removing unwanted programs, toolbars and unwanted start ups. Mainly, start up programs are responsible for increase in boot up time for your computer. These programs starts , when your computer boots and these programs running in background continuously , using resources of your computer , hence , it results in slowing down of your computer. These programs are the mostly unwanted programs which automatically merges in to start up menu. So, its better to uninstall these unwanted programs to increase speed of your computer. 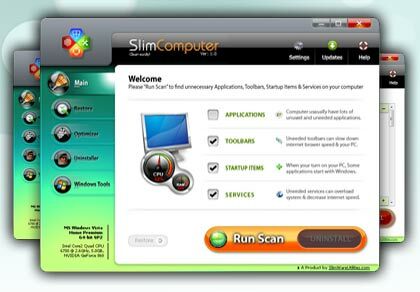 A Slim System - Get rid of the promo bulk that comes on a new PC. Just press scan, after scan , it will automatically recommend you which program to remove. You can download this program from here. It is free to use and it is just 6 mb in size.